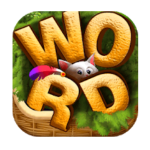 If you come from the topic that talks about Word Cats Level 549, then you are on the right one that will help you for sure to achieve without problem the next one : Word Cats Level 550. The game is a kind of a classic word game where you have to swipe between letters to form words. These words should be valid and are splitted in too kinds : Requested Words and Bonus Words.Since you are here, you will find all the answers and bonus words I encountred. If you find others, please do not hesitate to tell in the comment in order to add it to the list. · Simply swipe letters to line up different words. You can swipe the letters horizontally, vertically, diagonally, forwards or backwards. · Invite Friends and get more coins, you can use coins for passing level easily. · You Can Unlock Special Levels Each 5 Levels. Moreover, You can unlock the story of the two Chef Cats after you pass Level 50. If the current level became a part of the past, you can open from now the next topic to get some help if you are stuck on some words : Answers for Word Cats 551. If you have any suggestion, please feel free to comment this topic. Games Answers provide help, hints, tips and tricks for puzzle and trivia games available on android and app store, all solutions are listed level by level. Game Answer is not affiliated with the App developers, we are just giving help to players to advance on their games. 2016-2018 © Gameanswer - All Rights Reserved.